London-based duo RocketNumberNine release their debut album “MeYouWeYou” this year on Norwegian independent label Smalltown Supersound. RocketNumberNine are a London-based duo consisting of brothers Tom and Ben Page, who craft a compelling mash-up of electronic, dance, punk and jazz. Recently, the highly anticipated debut full-length, entitled ‘MeYouWeYou’ was released on the prestigious Oslo-based independent label, Smalltown Supersound. Home to luminaries such as Lindstrøm, Kim Hiorthøy (whose stunning artwork graces the sleeve), Toy, Pechenga, Drivan, and many more, RocketNumberNine fit right at home. The sound that the Page brothers conjure up is something unique and utterly contemporary, where the dazzling rhythms and hypnotic beats transport you to far-away reaches of the soul. A cosmic spirit is forever inherent in RocketNumberNine’s sonic creations, where space is indeed the place. My first introduction to the highly gifted Page brothers was the 12″ release of the band’s epic ‘Matthew & Toby’, home to Kieran Hebden’s TEXT imprint. Across thirteen euphoric minutes, RocketNumberNine journey through the inner and outer reaches of the rhythmic universe, recalling the likes of Steve Reid and Four Tet. Halfway through, the track evolves into a spaced out dimension of futuristic electronica and sustained tones. Minutes previously, a colossal force of frenzied post-rock infused jazz soundscapes flood the atmosphere. RocketNumberNine would play ‘Matthew & Toby’ each night of their support-slot tour to Four Tet (Kieran Hebden), where Hebden soon realized the vital importance of recording this track in a studio, as he witnessed the intensity this mind-blowing music was capable of transmitting. ‘Matthew & Toby’ – amazingly recorded and mixed in a single day – closes the debut album, ‘MeYouWeYou’, which serves the ideal climax to a breathtaking sonic voyage. The album opener ‘Lope’ – which music video was recently released – opens with swirling drumbeats and gorgeous synths. The track builds upon intricate layers of instrumentation, as an eerie atmosphere is created recalling the likes of Seefeel. The tempo remains at a slow, seductive pace. Some while later, the bass groove rhythms come to the fore, sharing shades of Ninja Tune’s roster of talent. The immense ‘Rotunda’ follows next. Polyrhythms and trance-dance beats guide this marvel through the desert plains of Africa, and vintage Detroit techno. Four Tet’s remix is irresistible as he transforms the piece into an organic house creation. ‘Steel Drummer’ showcases the peerless drumming skills of Tom Page. The cosmic spirit of Steve Reid radiates vividly throughout – a dedication and appreciation for a close and dear friend – as the synthesizers of Ben Page escalate into new dimensions of lost sound. The musical telepathy between the brothers is wonderfully set alight here. The results are nothing short of staggering. ‘Black And Blue’ is one of the centerpieces of Part B. The brooding space-age ballad is one of the hidden gems of ‘MeYouWeYou’. A plethora of sounds escalate from the percussion and synths/keys as the dynamic changes to a crescendo of menacing terror towards the close. Again, the drum patterns are a joy to behold. London-based Soul Jazz Records released the band’s ‘Lone Raver’ E.P. in 2011, featuring ‘Black & Blue’ on the A-side. ‘Lone Ranger’ is the penultimate track on the debut album. The opening flurry of noise containing waves of percussion conjures up the sound of Sun Ra (RocketNumberNine is named after a song of the same name by the legendary artist), before the infectious synth-led melody dominates the headspace. Halfway through, the keyboard and synth sounds are processed through new registers, creating in turn, new shades and textures of shadow-filled streets and neon lights. 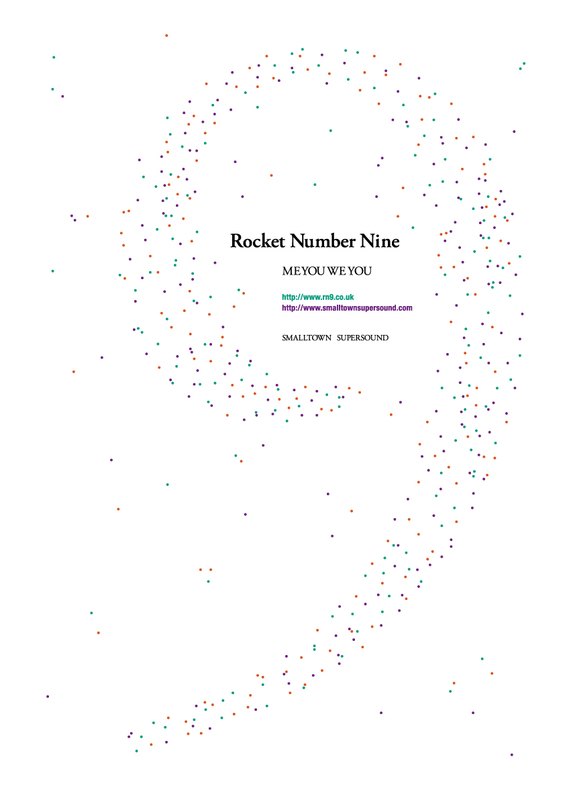 RocketNumberNine have toured extensively with Radiohead (having been invited by Thom Yorke to open a show at The Roseland Ballroom in New York, in late 2011), Kieran Hebden’s Four Tet, Dan Snaith’s Caribou, Nathan Fake, and James Holden. This stellar lineup of innovative artists says all there needs to be said for the sonic mastery of the Page brother’s blend of modern dance music. The band’s incendiary live performance is immaculately captured on ‘MeYouWeYou’, creating one of the year’s most exciting and innovative records. An array of collaborations have also been introduced to the world on precious vinyl format that forms an indispensable part of any invaluable record collection. The collaborative work with Four Tet (available on TEXT) produced two sublime tracks, ‘Metropolis’ and ‘Roseland’, the latter evokes the spirit of Alice Coltrane, Steve Reid and beyond. Also, a collaboration between singer-songwriter, Miss Neneh Cherry resulted in another heavenly sonic creation. “MeYouWeYou” is out now on Smalltown Supersound.